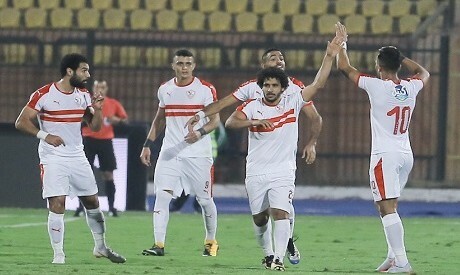 Goals from winger Mahmoud Kahraba and midfielder Ferjani Sassi either side of the interval gave leaders Zamalek an easy 2-0 win over Petrojet on Friday as they extended their winning run to eight games in the Egyptian Premier League. Kahraba finished off a fine move to open the scoring on 23 minutes, taking his tally to eight league goals, on level with the competition's top scorers -- teammate Mahmoud Alaa, Arab Contractors striker Ahmed Ali and Dakhleya striker Hossam Salama. Sassi converted a controversial second-half penalty to wrap up the win as Zamalek moved eight points clear of nearest challengers Pyramids FC. Petrojet remained second from bottom 15 points from 18 games. Ahly, Zamalek's perennial rivals, will now be under pressure to win all of their rescheduled games to close to within three points of their Cairo nemesis. Petrojet could have caught Zamalek by surprise after 18 minutes when forward Mohamed Salah escaped the attention of his marker to break clear, only for in-form goalkeeper Mahmoud Gennesh to thwart him in a one-on-one. It was then a one-way traffic, with Zamalek going ahead and wasting a couple of goal-scoring chances to extend their lead before the break. Kahraba put them ahead with a delicate first-time lofted effort over the keeper after he was released by a brilliant flick from deep-lying forward Youssef Ibrahim on 23 minutes. Lone striker Kabongo Kasongo had a side-footed effort tipped over by the keeper before Kahraba missed a sitter on the stroke of halftime, drilling a low shot just wide when well-positioned to score. Zamalek remained largely in control in the second half, although Petrojet managed to create some half-chances. Any hopes Petrojet had of salvaging something from the game were extinguished when the referee awarded Zamalek a penalty after winger Mostafa Fathi theatrically tumbled to the ground after minimal contact with a defender. Sassi made no mistake from the spot as Zamalek continued their steady march towards their first league title since 2015.